Corzan® pipes and fittings are joined using a fast and easy two-step solvent-welding process. Local codes determine which method is acceptable in your area, but the two-step method is more commonly used in the U.S. These directions are an overview of the instructions created by the Plastic Pipe and Fittings Association. Before any installation, please confirm the correct instructions from the manufacturer and any local codes. Pipe and fittings must be at the same temperature prior to start of installation. For proper solvent welding of Corzan pipe and fittings, the primer and cement dauber should be no less than half the size of the pipe for sizes 3” and below. Larger sizes require the use of a swab. Corzan piping systems can be cut using ratchet cutters, wheel cutters or a fine-tooth saw. When cutting into previously installed Corzan pipes and fittings, avoid use of ratchet cutters as these may compromise the integrity of the repair. If any indication of damage to the pipe is visible at the piping end, cut back at least 2” beyond the visible damage. Remove any burrs or filings and bevel the end of the pipe using a chamfering tool. If a chamfering tool is not available, a sharp knife or file is suitable, but not preferred. Using a clean, dry rag, wipe away any dirt and moisture from the joint surfaces. Check the fit of the pipe and fitting; the pipe should make contact with the socket wall 1/3 to 2/3 of the way into the fitting socket. If the pipe goes all of the way into the fitting at this stage, discard the fitting. Apply a heavy, even coat inside the fitting socket, keeping the surface and applicator wet until the surface has been softened. Then, drain any puddles of primer from the fitting socket. Next, apply the primer onto the end of the pipe 1/2″ beyond the depth of the fitting socket. Then for a second time, work a second coat of primer into the fitting socket. Ensure proper coverage of cement on the pipe and fitting. Too little solvent cement can result in gaps and leak paths, and too much solvent cement may puddle in the fittings and/or pipe, softening the material. Apply a heavy, even layer of solvent cement on the pipe end, then apply a medium layer of solvent cement into the fitting socket. Apply a second, heavy layer of solvent cement to the pipe end. 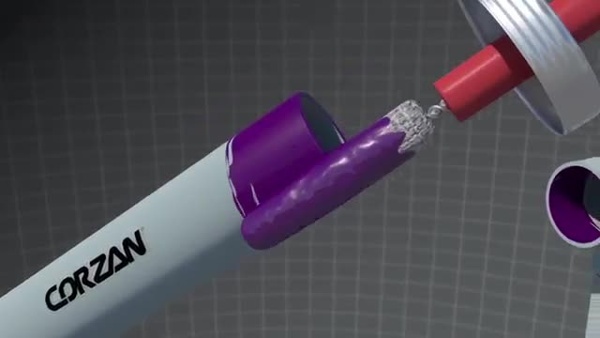 Immediately after applying solvent cement, insert the Corzan pipe into the fitting in one smooth action, until the pipe is completely to the fitting stop. On sizes 2″ and below, rotate the pipe ¼ to ½ turn while inserting to ensure even distribution of cement. Properly align the fitting and hold the assembly for approximately 30 seconds, allowing the joint to set. Solvent welding is a form of welding that uses chemistry and geometry rather than heat to produce a permanent molecular bond. When the right mixture of solvents and radial pressure are applied, the pipe and fitting become permanently bonded, functioning as a single component. Solvent welding is not gluing. Glues work by providing a sticky layer between two components to create a bond; if the two parts were actually in direct contact they wouldn’t stick because there would be no glue between them. Solvent welding requires the two components to come into contact as the solvent cements allow the parts to molecularly bond with each other. Interference Fit: the inside of a Corzan piping system is specially tapered to create a “fusion area.” In a properly assembled system, 80% of the joint strength comes from this fusion area. Because of this it is important to ensure that installers avoid angled pipe cuts, clear away burrs and filings, and check the fit of the pipe and fitting prior to solvent welding. Corzan piping systems are supported by a team of consultants; to learn more about solvent welding and proper installation practices, contact us today.